If you’re Italian, you might not agree with me calling this dish a bruschetta. Typically, bruschetta refers to a grilled bread appetizer from central Italy that is rubbed with garlic and topped with extra-virgin olive oil, salt, pepper, and other local ingredients. Outside of Italy, it’s common to see chopped tomato, basil, onion, and mozzarella on bruschetta. I use the term liberally – basically, anything aside from butter and jam on my toast constitutes bruschetta. With my very limited ingredient palette and severely restricted diet due to extensive food intolerances, it helps for me to dress up my food with language when I can’t dress it up with too much else. 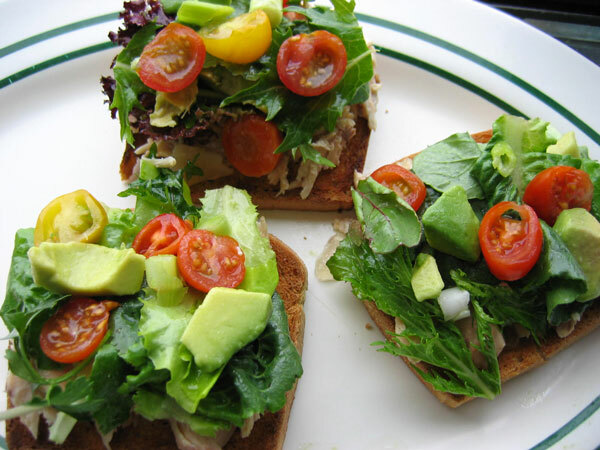 This is one of my favorite quick meals to eat when I’m in the mood for toast but want a meal with substance. I was using delicious gluten free amaranth bread for toast from the now defunct Francis Simun Bakery in Dallas when I took these photos. Now I am using Food for Life’s yeast-, wheat-, and gluten-free Multi Seed Rice Bread. As always, all ingredients are organic and fresh. You can use any variation of your favorite salad ingredients. I like to include onion or scallions for a nice bite, balanced by the creaminess of avocado and a burst of flavor from ripe cherry tomatoes. You can also make this without the chicken for a lighter, but just as delicious, snack. Be prepared – this can be a messy dish to eat (my favorite kind!). Toast bread to desired darkness. Place chicken pieces on top of toast. You can eat the chicken cold or warm it up for a nice contrast with the cold salad ingredients. Cover with chopped lettuce, avocado, scallions, and tomatoes and add seasonings as desired.